David Laskin, just 15 from Elk Grove, CA scored under par both days for a 138 total. 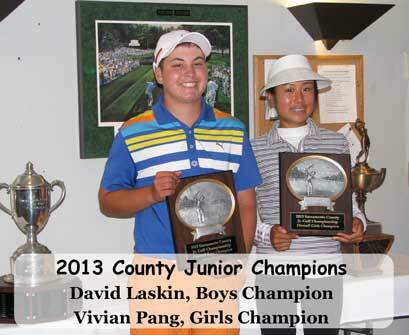 Laskin won by two strokes of Austen Sandoval. Vivian Pang, a 13 year old from San Ramon, CA, won the Girls Champioship scoring a 2 under par 70 to match scores with 17 year old E. Virgie Valezquez of Roseville, CA. They both scored 148, and had a single playoff hole, with Pang making birdie to win.